One of the finest graphics cards we've had a play with, and even manages to hold its own against factory overclocked GTX 680s, let alone reference boards, or the limping AMD competition. Nvidia has just released its second tier Kepler graphics card and the Zotac GTX 670 AMP! Edition is first to the punch trying to muscle in on the top-table. The standard Nvidia GeForce GTX 670 is quite a performer in its own right, with the same GK104 GPU as in the top Kepler card, the Nvidia GTX 680. That chip has only been slightly pared-back with a single SMX module having been removed. That means it's running fewer CUDA cores, but with 1,344 of those wee processors still humming away inside the GTX 670's GPU it still manages some impressive performance figures. 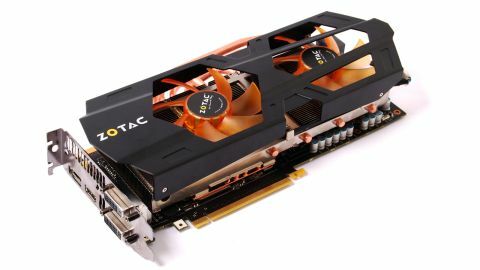 Nvidia, however, has allowed board manufacturers, like Zotac here, to play around with the reference PCB from the get-go, and that means we get factory overclocked cards at launch. Praise be to Nvidia for that, because the Zotac GTX 670 AMP! Edition is one hell of a graphics card. Compared with the rather conservative 915MHz base clock of the reference Nvidia GeForce GTX 670 the Zotac GTX 670 AMP! Edition's 1,110MHz starting point is lightning fast. Paired up with that is the boost clock of 1,176MHz which is even more impressive, especially when you consider the impressive Nvidia GPU Boost tech will actually take that clockspeed even further. To cope with the sort of heat the overclocked GK104 GPU is putting out Zotac has opted for a redesigned cooler. The chunky twin fan configuration on the GTX 670 AMP! Edition means that, internally, it winds up as a bona fide triple slot graphics card. So technically it looks pretty special, how does that play out in terms of actual straight line performance? The simple fact is that, across the board, the Zotac GTX 670 AMP! Edition beats the Nvidia GTX 680 hands down. That card will overclock more to push it ahead again, but on out-of-the-box performance the Zotac card has it sealed up. Put it up against the equivalent-priced AMD Radeon HD 7970 and the red-badged competition is, on the whole, put firmly in its place.